Paulo, as a corporate consultant at PwC, brings together corpoates and startups, helping both sides to achieve their goals. Prior to his time in the start-up ecosystem, he worked for 3 years as an IT consultant on transformation and efficiency enhancement projects nationally and internationally. His focus is the use of technologies to increase the efficiency of work processes and the development of sustainable business models. 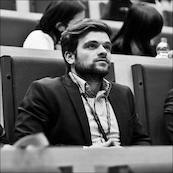 Paulo completed his master studies in Bremerhaven, Kassel and Lisbon in the field of Economics: IT & Sustainability.